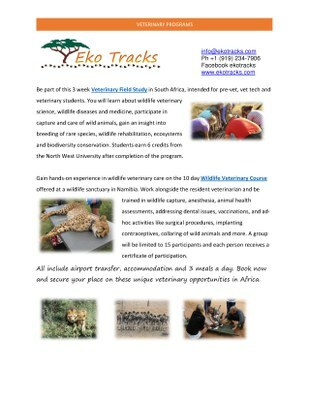 Eko Tracks offers a 6 credit Veterinary Field Study, a wildlife veterinary course and a veterinary continuing education program, accredited by the American Association of Veterinary State Boards. Eko Tracks also offers internships and volunteer opportunities in wildlife conservation. Leggi tutte le informazioni utili per partecipare.